I’ve decided to go more “art” that “writing” this week. Not that I don’t have anything to say, but I decided this time to say it with pictures. First up is a sketch I did for a student last week. I figure it’s good enough to be my first annual “St. Patrick’s day print and color drawing”. So copy it, print it, color it. Or give it to some kid you know to color! Have fun!! I recently finished (YAY!!) my “Mutant Elf” strip for the SPACE anthology comic (available online for free and in print format at this year’s SPACE convention!) and I thought I’d share a teaser. This is a black-and-white scan from before I colored the book. I used my newly bought PITT colored markers and had a blast working in color for a change. I don’t think I can stop Mutant Elf with just this one story! I have some loose plans to run with this idea in some format in the coming year! Stay tuned!! But on to the movie itself! The Ides of March is a political thriller. It really keeps you guessing as to what is going to happen with all kinds of twists and turns. I can’t say too much about the plot without giving things away, and I do so hate spoilers! The movie concerns the political machinations surrounding a mythical Democratic primary election. In this movie, all the Democratic politicians seem to hate each other. This is rather interesting as it looks like the real life Republican primary election is among a group of guys who have nothing nice to say about each other. There’s a lot of wheeling and dealing among the political teams in this movie, and our main character (Stephen) tries hard to keep his integrity despite all the rottenness that piles up around him. I don’t know if the movie would be interesting to someone who knows nothing about politics and campaigns. I like to watch political coverage and I know a lot about our American political system and how messed up it can be at times. It does make a good setting for a tale involving things such as dirty tricks and drama. I’d recommend this movie to anyone who is interested in the genre. It kept me interested throughout and guessing until the end. And I really need to review Ryan Gosling’s portrayal of me. I mean, portrayal of Stephen. I think he did a great job in this film. He carries the movie and in this film it is very important for the viewer to understand the main character’s motivations and feelings. And if, by chance, there was a movie made about me, I would be happy to allow Mr. Gosling to play me. And he’d probably be an even better performance than Ides of March since he’s had practice as Stephen Meyers! Ryan Gosling as Steven Myers? I recently saw a joke on Facebook that went: Fantasy Football is Dungeons and Dragons for jocks! Yes, I think it’s funny. However, there’s this little problem. You see, I play both! Where does this put me? Geek? Jock? Jeek? Somewhere in the nether region that exists between the extremes? Well, okay, it isn’t that hard. I’m definitely somewhere between. In fact, perhaps it isn’t so smart to try and fit people into such neat little categories. Perhaps, people are all individuals that should be judged on a case-by-case basis. For example, the Fantasy Football league I’ve been playing in for years is made of a bunch of guys who met on a comic-book message board. Yep! We’re just a bunch of comic book geeks who love Football. Is that so bad? Can society exist with such people? I think my interests are quite diverse. For example: reading, drawing, sculpture, skepticism, playing guitar, playing games and playing tennis probably top my list of interests. You can divide some of these interests into categories too such as role-playing games, board games (including war games, strategy games, and fantasy board games), fantasy sports games, and card games. In fact, maybe I have too diverse a list. Perhaps I should concentrate more time on fewer things. But rather, I’m more likely to look for newer things to add to my list. Speaking of lists, one thing on my “to-do” list that’s getting done is my “Mutant Elf” story for the SPACE anthology. I just finished the inking, which means the only thing left is the coloring! It’s going to be fun to do some full-color work since I usually do comics in black-and-white. I’ll have to post a teaser when I get done. Finally, I’d like to mention something about Whitney Houston. I really really used to love her work. Her first two albums are among my favorites and I think at one time there wasn’t a better voice anywhere. I didn’t like her subsequent work as much, nor her movies, and it was sad to see her destroy herself physically. I wish her family strength in dealing with their loss. Jackie Robinson is my all-time favorite athlete. Not only did break the color barrier in sports, but he did it with class. He was a great ballplayer, a true gentleman. He put up with a lot of grief, and he risked his own personal well-being every time he took the field. And he was a catalyst for a change in society. Jesse Owens not only won 4 gold medals in the 1936 Olympics, but he did it in front of Adolf Hitler against the Fuhrer’s “master race.” It was a symbolic blow against the Nazis, and something the world needed to see at the time. The 1980 US Olympic Hockey team was a bunch of college kids taking on the Soviet Empire. Or something close to such. It was an uplifting event for a country that seemed to be losing confidence in itself. Jim Abbot. Every time he took the field. He still makes me think I should be doing more with my two hands every day. Well, these are the stories that come to my mind as going beyond the usual reach of sports and touching society. Perhaps you have some favorite examples of your own. Feel free to comment here. Next week I’ll probably be discussing something a little closer to my normal comics/pop culture topics. See you then! I received Candy or Medicine volume 16 in the mail this week from editor and publisher Josh Blair. Candy or Medicine is a mini-comic with 16 quarter-sized pages, black and white, printed on premium paper. Allow me first to explain a little about Candy or Medicine to those who haven’t heard of it. Candy or Medicine is a quarterly anthology comic that consists of comics and artwork of just about any subject matter. You never know what you’re going to find inside when you pick up an issue. Chances are you will find something inside that is worth the dollar you paid for the book! In the spirit of full disclosure, I have contributed to Candy or Medicine. Specifically, I did a two page story in volume 12. But today I’m talking about volume 16, so let’s get on with it! The cover is by Emi Gennis. The cover illustration is a clever play on the title of the book. A slot machine with candy and medicine on its reels! Great idea! And the lady pulling the lever, well, I think I remember seeing her last time I was in Vegas! The first comic is called Ziff and is by Jim Gullet. Ziff is the meanest fist of the apocalypse! Ziff comes to a village of lizard men to collect a bounty. Ziff himself isn’t a lizard. Or at least I don’t think he is. I’m not sure what to call him in fact. The art is very nice with lots of thin line work and the storytelling is well done. The perspective needs some work, but I like the overall look of the story. Scratchy/doodle-ish like a mini comic should be! The second strip, by Nate McDonough, doesn’t have a title. It is a little tale of a very short man who encounters larger and larger people on a street. Neat, stylistic art, and a nice twist ending make it a rather charming piece. Since it has very little dialogue, the storytelling must be very clear and it succeeds admiringly well. Waltz no. 63 is the last sequential tale in this volume. It has some very creative artwork and is all about the things that may exist in the woods. Small, tight panels and very creative illustrations make this little strip a nice ending to the book. But it doesn’t end there! There are two more illustrations, by Andy Nukes and Robert Dayton that are a nice little coda to the book. Andy’s is a funny drawing and Robert’s is a nice little joke. 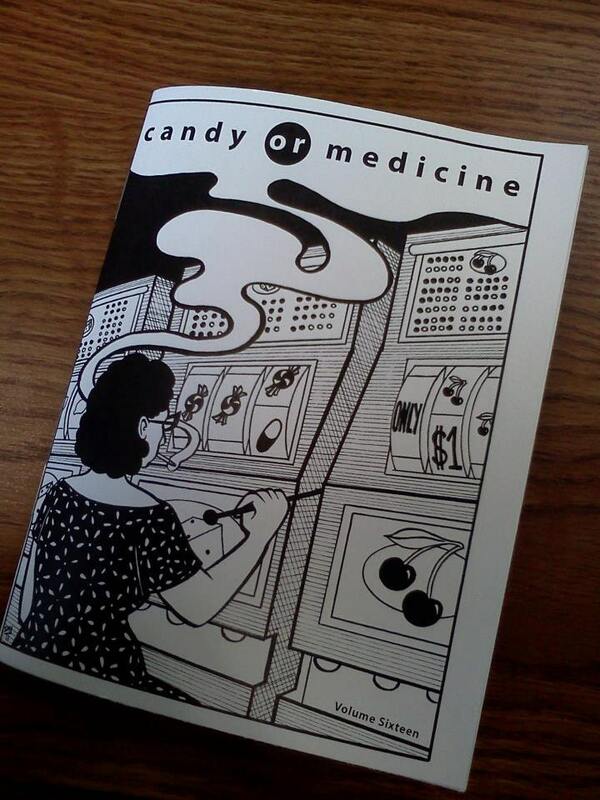 Candy or Medicine volume 16 is available for $1 plus shipping and Josh also accepts trades from other publishers. Josh always seems to put together fun little comics for Candy or Medicine. To see more checkout Josh’s website where you can order his books and download some more for free! You can also order from his etsy site. Josh also writes his own blog, with many entries on small press and other comics. For information about the creators featured in Candy or Medicine, click here.